Matthew Hodson, a visiting lecturer from City's School of Health Sciences, has been named as the Nursing Standard's Nurse of the Year for 2013. Matthew was instrumental in establishing the Breathing Space Clinic at St Joseph's Hospice, Hackney, which helps terminally and seriously ill patients who have advanced chronic obstructive pulmonary disease (COPD). COPD kills 25,000 people a year in the UK, and an estimated three million people are living with the disease in England. However, despite the prevalence of the disease there is very little support in place for suffers. It was with this in mind that Matthew set up the Breathing Space in 2011. 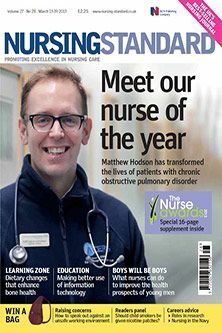 Nursing Standard's editor-in-chief, Jean Gray, said: "Matt's work is shining a light into an area of healthcare all too often overlooked, despite the thousands of patients who live with COPD's distressing symptoms. He is an inspiring ambassador for the nursing profession." Matthew Hodson lectures on the COPD & Asthma CPD Module at City University London.